A new take on making the pickup truck fuel efficient. Nipping at the heels of the Chevrolet Silverado in both sales and reveal dates is the Ram 1500, the newest iteration of which FCA has just unveiled at the 2018 Detroit Auto Show. Suffice it to say, it packs a very interesting surprise under the hood. Following in the footsteps of GM with its eAssist tech found in the Chevy Silverado and GMC Sierra, Ram has included a 48-volt mild hybrid system to the 1500's V6 and V8 powerplants. A more conducive conversation starter, however, may be the design. The new grille is a dramatic departure from the crosshairs we saw on past Ram trucks. It’s complimented by all-new LED headlights that “interlock” with the grille to create a focused yet more sophisticated look for the truck while sealing up the seams. Along with subtle tweaks to the body are grille shutters, and an air dam which, when combined, afford the Ram an air-slicing drag coefficient of .357—a segment best. Though this truck is longer and wider than the Ram it replaces—with gains translating to over 4-inches of additional cab length—it loses 225 pounds by means of a new frame chalked full of high-strength steel and the use of lightweight components such as an aluminum tailgate. Given the highly competitive nature of the segment, Ram is keen on making test drives as comfortable as possible and did so by adding self-leveling air suspension as standard. It then added frequency response dampening shocks to improve the ride both on and off the road. For drivers that’ll spend more time in the latter scenario, Ram is offering a 4x4 package that lifts the suspension by an inch, adds an electronic locking rear axle, tweaks the shocks to take more of a pounding, and throws hill-descent control into the mix. Ensuring the Hemi stays alive during a time when CAFE reigns king, Ram installs its eTorque mild hybrid system onto its 5.7-liter V8 as well as the 3.6-liter V6 Pentastar. A belt-driven motor generator and a 48-volt battery pack affords both engines the luxury of easy start/stop, brake energy regeneration, and short-term torque assist that can add 90 lb-ft to the Pentastar-equipped Ram and 130 lb-ft to the Hemi V8. 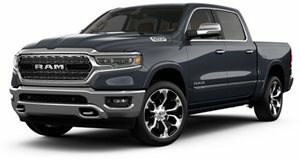 Along with cylinder deactivation, the 2019 Ram employs as many fuel-saving tactics as possible but can still churn out 305 horsepower and 269 lb-ft of torque using the Pentastar or 395 horsepower and 410 lb-ft of torque with the Hemi (though the V8 can be had without the mild hybrid system). That power gets piped to the wheels through an eight-speed TorqueFlite automatic transmission and, when the V8 is the chosen workhorse, can tow up to 12,750 pounds and carry 2,300 pounds in the payload. Work isn’t the only thing on the Ram’s mind, however. When it comes time to enjoy the fruits of labor, the FCA festooned the Ram with plenty of new colors, trims, interior and exterior storage space, and technology including driver aids, device connectivity, an optional 12-inch touch screen. Apple CarPlay and Android Auto come standard while WiFi can keep these devices tethered to the Internet to be used to feed the available 19-speaker Harmon Kardon sound system with media. Be on the lookout for the Ram in Tradesman, Big Horn, Laramie, Rebel, Limited, and Longhorn trims by the end of March after prices come to surface later this month.